We are making room in our rack and parting with our Manley Voxbox. It has been kept in a smoke free studio and works flawlessly. A "Magic Box" for More Than Just Vocals! Manley's all-tube VOXBOX channel strip may well be your "last stop" voice processor, but it's also set to make the most out of virtually any source you throw its way. The VOXBOX shares its fully featured microphone preamplifier design with Manley's acclaimed Mono Microphone Preamplifier, offering a whole lot of headroom and Class A vacuum tube tone. All of these features, in addition to a flexible Pultec-style mid frequency Equalizer, de-esser/limiter section, and Stereo Link function, make the VOXBOX a true sonic studio workhorse. Manley VOXBOX Channel Strip at a Glance. Fully featured microphone preamplifier section. Since the late 1980s, Manley has been steadily focused on crafting premium, all-tube gear. In short, Manley really knows tubes - and the case is no different with the VOXBOX. This USA-made channel strip boasts all-tube, Class A circuitry, alongside the kind of exceptional, robust build quality you can expect from Manley. True to its name, the Manley VOXBOX is packed with a superb microphone preamplifier section. In fact, the preamplifier design arrives straight from Manley's popular Mono Microphone Preamplifier, giving you all the essentials for excellent, analog tone - whether you're going in via regular, balanced XLR, the balanced line input, or via the 1/4 front-panel direct input. You can use the variable input attenuator that's before the first tube stage to accommodate +4 line level signals or DIed instruments. Onboard, 48V phantom power is switchable from the front panel and an effective Bass Cut switch lets you pull out rumble. Finally, a clever gain switch lets you control how much feedback is introduced around the tube circuit, so you can achieve a wide variety of tones and amplification levels. Change tonal tube flavors quickly and easily as you dial in everything from the laid back and mellow to the up-front and aggressive - it's a great way to get creative and track down that "perfect" sound for each vocalist or instrument. Manley also figured out a way to compress the signal before it hit the tubes - without adversely affecting distortion or frequency response. What this means for the VOXBOX, is that it can both prevent mic-pre clipping as well as eliminate entire stages of electronics, cutting your microphone's typical path in half - a huge advantage. Manley also pioneered a sidechain design, developing a "Parametric Compression" technique of using up to four different time constants simultaneously and controlling them with simple attack, release, and threshold controls. The VOXBOX's onboard presets are based on the Light Dependent Resistors of their fast ELOP limiter, the quick LA-2A, the slower LA-3A, and there are also various other complex and finely Manley-tuned settings. In all, you can expect fresh sounds from the VOXBOX's compressor - perfect for drums, bass, vocals, and more. In fact, it's even a great compressor to send your whole mixes through - just link up two VOXBOXes for an extremely sonically flexible stereo world. Manley took their Pultec-style Mid Frequency Equalizer up a few notches when they added it to the VOXBOX. It's now extended to 33 frequencies in 3 bands, so it offers six new frequencies from 20-150Hz as well as six new frequencies from 6.4-20kHz. With real inductors and Class A circuitry, the VOXBOX's Equalizer is set to serve up that "magical" sound. An EQ input switch lets you patch in the line input, preamp output, or insert return. The switch also acts as a bypass switch for the preamplifier or external processors, for processing two different tracks. The VOXBOX's de-esser and limiter section gives you even more flexibility with the source. The peak limiter is based on the ELOP limiter design, and Manley added a passive LC network to take care of the de-essing. There are four carefully chosen notch frequencies - 3kHz, 6kHz, 9kHz, and 12kHz - to tame problematic frequencies. Plus, a fifth position offers up a LA-2A-style limiter - compress pre-EQ, then limit post-EQ. You can also seamlessly and smoothly insert the de-esser as the music plays, so you only use it where you need it. The Manley VOXBOX is packed with a full-size, illuminated Sifam VU meter. An included 5-position switch lets you switch between levels - monitor line input, preamp output, and final output audio levels as well as compressor gain reduction and the de-esser/limiter action. 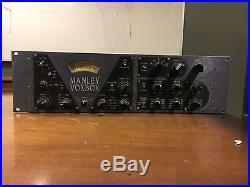 Manley gave the VOXBOX a few clever "extras, " including warm-up muting circuitry that you can bypass using an internal switch, making the VOXBOX perfect for both the studio and the stage. Other welcome additions include extensive magnetic field containment, "smart grounding, " and silent switching. Manley VOXBOX Channel Strip Features. Manley Transformers w/nickel laminations in mu-metal cases. 2K ohm MIC INPUT Z w/High current 48V Phantom power built-in. Hi-Z (100K) Direct Instrument Input. LINE & INSERT INPUTS (balanced XLR & 1/4). PREAMP & EQ outputs LO-Z (50 ohm). STEREO LINK for Compressor & De-esser/Limiter. SIDE CHAIN MONITOR for De-Esser. Large ILLUMINATED Sifam METER with FIVE readout modes. De-Ess Notch Frequencies: 3, 6, 9, 12KHz. Dimensions: 19" x 5.25" x 10 (occupies 3U). 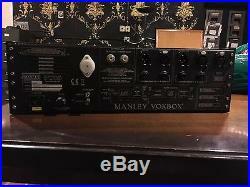 The item "Manley VOXBOX Channel Strip Class A Mic Pre, EQ, Comp, Limiter/De-esser" is in sale since Thursday, December 15, 2016. This item is in the category "Musical Instruments & Gear\Pro Audio Equipment\Preamps & Channel Strips". The seller is "emoorefilm" and is located in Salt Lake City, Utah. This item can be shipped to United States.